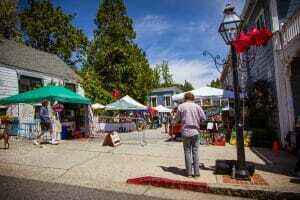 April 12, 2019 – The 2nd annual Village Market Day, returns to historical downtown Nevada City, Sunday, May 19, from 11am to 5pm. This city-wide celebration shines a spotlight on the town’s vibrant and creative shopping district along with its burgeoning food, craft beer and wine scene, plus local entertainment and artists. For one day only, visitors can take advantage of restaurant discounts and shopping specials. In addition to Nevada City’s brick and mortar shops featuring everything from antique and vintage items, to handmade and local homewares, clothing and jewelry, along with imported world goods, musical instruments, garden and outdoor treasures, rare books and more, Village Market Day will also include over a dozen vendors lined along the streets selling unique and one-of-a-kind items. Foodies will also find delicious offerings such as Farm to Table, pub faire, Thai, Italian, plus artisan chocolates and ice cream. Art lovers can also spend the afternoon exploring local galleries or history buffs can visit restored Victorians homes in our neighborhoods. The California Arts Council recently selected 14 districts to serve as California’s inaugural state-designated Cultural Districts. Nevada County is home to two of them – Grass Valley-Nevada City and Truckee. These districts highlight some of the thriving cultural diversity and unique artistic identities within local communities across California. A map will be provided to lead your way through the fun activities throughout downtown. Pick up a copy at the info booth in front of the NY Hotel, various vendors or at The Chamber office.